In the first film to come from his new production company Top Rebel, actor/producer Freddy Rodríguez (TV’s “Six Feet Under”) plays Roman Lindo, a man who finds himself in the middle of a ruthless divorce with his equally hateful wife Victoria (Marley Shelton). In an attempt to settle their differences peacefully, the couple decides to meet face to face in the presence of a court-appointed mediator before things get uglier. Unfortunately for everyone involved in this short dark comedy by director/writer Francisco Lorite, the worse is yet to come once Roman and Victoria lock eyes for what might be the last time. What do you hope to prove with the creation of your new production company Top Rebel? I like to call our first project, “Mediation,” to come out of this production company a “mini-feature.” It’s a calling card. It’s the type of project we want to create in this company. We want to show that we can bring a certain level of quality to the stuff we put out. I like the term “mini-feature” you just used. 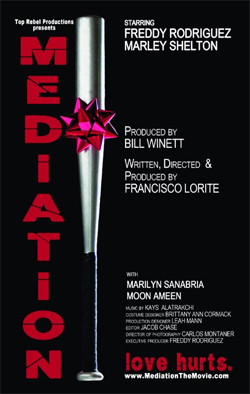 “Mediation” is, of course, a short film, but it sounds like you want it to be more than that. I think that was always the intention – for the film to have a beginning, middle and end. We wanted to show how we could execute a film. I think our intentions for making the film are different from other people making short films. We wanted people to walk out of a theater feeling like they had just seen a [feature] film. Is part of the reason you started the company also because you felt there was a need in this industry to create roles that just are not being developed or given to Latino actors like you? Absolutely, I think that is part of it. I think I’ve been really fortunate and very blessed throughout the years. I think for half my career I’ve played other ethnicities besides Latino. I wanted to continue that in [Top Rebel] and create more of those regular characters. I’ve always been an advocate of that and I think the company will continue that tradition. I’m sure you know, there are a small handful of go-to young Latino actors in their mid to late 30s today that end up filling that demographic a studio might be looking for. I mean, I’m talking about actors like you, Michael Peña, Jay Hernandez, Gael Garcia Bernal, Diego Luna, Jacob Vargas. Do you feel lucky that your name probably comes up in these conversations and that the pool is small or do you think a few more options would be nice? I’m grateful to be part of that group of actors. Of course, it would always be a much better situation to have more options. There are many more talented Latino actors out there than the names you just mentioned. I’m sure there are. I hope that through [Top Rebel] we can create more characters and give those types of actors a chance. You’ve battled zombies in “Planet Terror” and Al Queda terrorists in “Seal Team Six.” Was going head to head with an angry ex-wife in “Mediation” even more daunting? (Laughs) It was a change of pace. Listen, at this point in my career I’m just trying to play different characters and be a part of different types of projects as an artist. It was fun to do all of those. It’s fun to explore all those worlds. Do you consider “Mediation” just a fun, stylish movie where divorce is at the center of the narrative or would you like it to say something deeper with the film about relationships that come to an end? I think that’s a question you should ask the director. As an actor, I read it and loved it and wanted to sink my teeth into it. I know you’re happily married now, but can you remember any bad break ups you’ve experienced in your lifetime – maybe not to the extent of the characters in “Mediation” – and how those affected you at the time? We’ve been talking for about 10 minutes now, which means, if I do my math correctly, about 46 couples have gotten divorced in the U.S. Those numbers are based on recent statistics that says a divorce happens every 13 seconds in this country. Do those kinds of statistics surprise you or is it something you think we’ve all grown accustomed to? I think it’s something we’ve all grown accustomed to. It’s what we see as normal. I don’t want to date myself here, but I’m old school. I’m still married. The divorce rate in my family is very low. We see marriage in a different light. We try to cherish the sanctity in that more. It’s unfortunate where our society is at today.